When you can’t decide on flowers or a treat for a special person and occasion, we say get both! That’s why our Memphis flower shop and gift website offers flower and treat packages that double the gift-giving while providing extra value for you as the giver. This gift set features one-dozen tulips along with a handmade scented lotion and soap set from local Memphis company, Snow Heart Soaps. 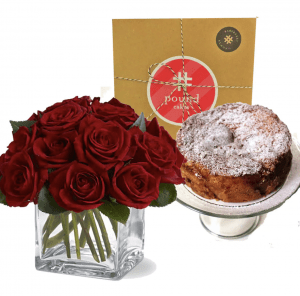 This gift package deal offers 12 red roses in a cube vase that is paired with a southern style pound cake from Memphis company, Judy Pound Cakes. Send a beautiful message with this gift packge of long-stemmed red roses and gourmet chocolates. It’s a great gift idea for that special someone in your life. 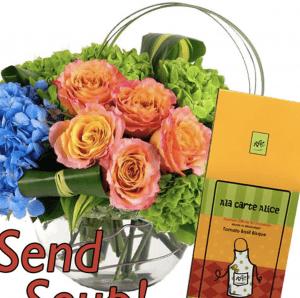 Made for cheering someone up or helping them feel better, this gift package offers flowers and soup. There is a choice of flavorst that include Shrimp Bisque, Southwest Tortilla, or Tomato Basil. This gift package offers a choice of blooming plants along with gourmet chocolates and a “Thinking of You” Mylar balloon. Give a cuddly stuffed teddy bear, a gourmet box of chocolates and two festive Mylar balloons. It’s a festive gift package deal! We have even more gift packages available on our website so be sure to check them all out! March Birthdays are Here to Celebrate!